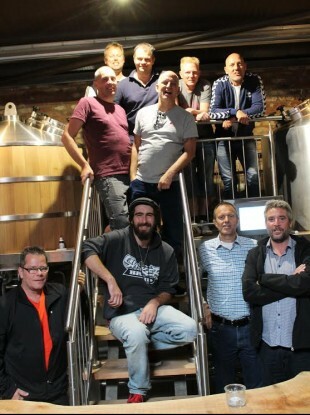 Mathis Korme at the Wicklow Brewery (2nd from left). BECOMING A MASTER brewer is no easy feat — particularly in Germany. It took Mathis Korme years of study and hard work to complete his apprenticeship. Originally from Dortmund — he worked in a range of breweries of various different sizes before returning to university to pick up his Masters degree. But — in spite of all that experience — the affable 26-year-old admits that he was stymied by one particular recipe when he took on his first job heading up a brewing operation. “It was the red ale, I thought — oh my god, how do you do a red ale? ” Mathis tells TheJournal.ie over a few samplers of the stuff at the newly-opened Wicklow Brewery in the village of Red Cross. Red ale is somewhere in between — you want a brownish colour to get the red. To get to this point — that it’s not too dark not too bright — turns out, that’s pretty hard. After a few experiments, and quite a bit of frustration, Mathis finally had a ‘eureka moment’. Eventually, with one of the batches, I saw the colour, and it was like blood orange… I was like ‘yes!’. Mathis’s red ale — or St Kevin’s Red Ale as it’s officially branded — is one of four initial offerings from what’s probably the country’s newest micro-brewery. It turned out very lovely, thankfully. One of three full-time staff members at the new brewing operation, which is attached to Mickey Finn’s pub in Red Cross, Mathis — who’s from Dortmund — has long been a beer aficionado. “I started my brew-master career after school,” he explains. When deciding on a third-level course “I had a decision to make — what do I want to do in the rest of my life?”. “You have to study something. So I joked — if it all doesn’t work out I’ll just study beer! The idea just stayed in my head. So I looked it up — and you really can study beer in Germany. An initial course in the well-regarded Weihenstephan University, near Munich, didn’t suit his learning style, however. I was sitting in a big hall with lots of students listening to some maths professor, and I was thinking ‘I just want to make beer, what do I need that for?’. He decided to take up an apprenticeship instead — but, given the state of the economy “it wasn’t good timing”. Luckily, a family friend knew someone — and eventually, he got his start at a small brewery in Cologne. Which was great, until “the brewery decided to go broke”. Casting around for a new home — he switched to a larger operation based in Iserlohn. Once the apprenticeship was finished, he headed back to college for a second time — to pick up that Masters qualification. So how did the newly qualified brew-master end up in a tiny village in the wilds of south Wicklow? A friend had taken up a job with Braukon — the German equipment company who were installing what would become the 15 hectolitre Wicklow Brewery for pub-owners Ashley and Leigh Williams. “He said — they’re looking for a brewmaster, do you know anyone? I said — yeah, me! Luckily, Mathis was already a “great fan” of Ireland and Irish culture — in particular, Celtic-punk bands like The Pogues and the Dropkick Murphys. Since his arrival, over the August bank holiday weekend, it’s been, so far, “great craic”. Sounds like someone’s blending in, doesn’t it? Note: Mathis also double-jobs as chief tour guide at the brewery, in addition to his role heading up their beer operation. You can find more details about the brewery here. Email “How does a German master brewer wind up in the rolling hills of Wicklow?”. Feedback on “How does a German master brewer wind up in the rolling hills of Wicklow?”.